Chawli recipe collection. Chawli beans are also known as cow peas or black eyed peas. They whitish in color with a black spot in the middle and have a rich nutty aroma. It is a legume that, like other legumes and beans, is widely used in an Indian kitchen. This is one of the few legumes that doesn’t even need spices for it to taste nice, it has a natural taste itself which is great. Chawli is cooked just like the other pulses and legumes and hence needs a significant amount of soaking time – overnight or at least 4 to 5 hours in warm water. After that, it is very easy to handle and to cook and hence it is used widely to make subzis and dals. Masala Chawli is a subzi that has the most irresistible aroma and flavor even though it uses the most basic ingredients. A basic Chawli Beans Subzi with flavored with tamarind, jaggery and chilli powder has a unique sweet, spicy and sour taste. Pumpkin and Chawli Errissery is a vegetable curry preparation from kerala that is traditionally made with these two ingredients and can be made healthy by adding less salt. Chawli beans are one of the key ingredients in a Gujarati dish called Mixed Kathol. Kathol is basically a mix of different pulses that are cooked together and served mainly during festive times. Another favorite that uses a combination of pulses is Misal Pav, every Maharashtrians staple street food preference. Not a lot of people associate pulses with snacks but that is a myth. Pulses can be transformed into great snacks that are not only nutritious but also delicious. Methi Palak Chawli Dhokla seems like a strange combination of ingredients coming together but flavored with ginger and green chilli with this combo, it’s a hit! People from Andhra use chawli to make Alasanda Vada, a scrumptious snack with flavors of onion and garlic coming through. It can also be used whole in Chawli, French Beans and Carrot Soup, which is hearty, comforting and warm. We have heard of potato patties or even rajma patties but now we have a very different and unique Chawli Beans and Mint Burger where the burger patty is made with chawli beans! This combination of flavors is pleasant to the palate and breaks away from the usual potato patty. Similar cutlets can also be used in the Indian Sizzler as one of the main elements. Chawli and Beetroot Soup is an easy soup cooked in a pressure cooker with a zesty taste that is unique enough to impress your guests. Chawli can be used in a plethora of salads with different types of ingredients, whether vegetables or fruits. It can range from a Chatpata Chawli and Fruit Salad, which is unique when combined with fibrous fruits like grapes and oranges or something more basic and common like the Chawli Paneer and Veg Healthy Lunch Salad. Even though rice is not considered particularly healthy, adding chawli and kabuli chana to rice, amps up the health quotient. 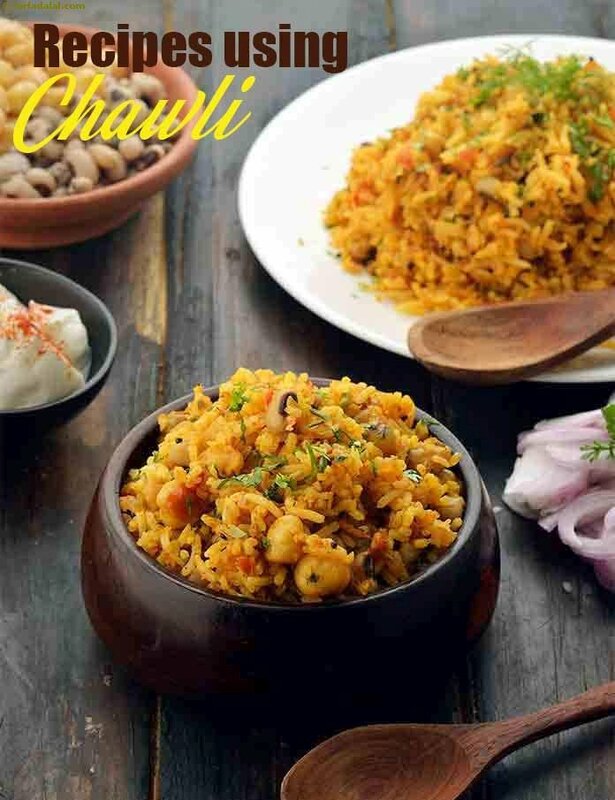 No need to have it as rice and curry, you can combine both and make Chawli and Kabuli Chana Pulao. Hope you like the Chawli Recipes. Check out the entire recipe collection below! An innovative recipe of chawli or lobhia beans served in a gravy that is flavoured with tomatoes, mint and kasuri methi. The addition of Chawli to this traditional Maharashtrian subzi boosts its vitamin A and iron content, making it a super healthy treat! A traditional thai salad of pounded long beans in an oriental dressing. Although the main ingredient in this recipe is red chawli, it is undoubtedly the shallots or madras onions that give this dish its unique aroma and flavour! feast on this spicy and nutritious recipe with a bowl of steaming hot rice topped with ghee.